As a favourite slice of coastal Californian wilderness, Point Lobos State Natural Reserve has captured my photographic eye on many occasions. Every season brings new colours and light to the landscape and seemingly endless sea, but every now and then, I like to investigate a familiar place with shades of black and white in mind. These two images were both created on the same day; bright sunlight at water’s edge with the sparkling Pacific ocean waves along the rocky coast fading into the distance, and dappled soft forest light falling over the repeating natural pattern and texture of whale bones. Scenes and details from Point Lobos State Natural Reserve in California; crashing waves, rocky cliffs and unique forest along the beautiful California coast. I love discovering how the larger features and themes of a place are so often echoed in the details, and it can be particularly satisfying to use black and white photography to explore and emphasize these similarities and contrasts. The bones and smooth shoreline rocks catch the sunlight in similar ways, highlighting their beautiful natural textures. 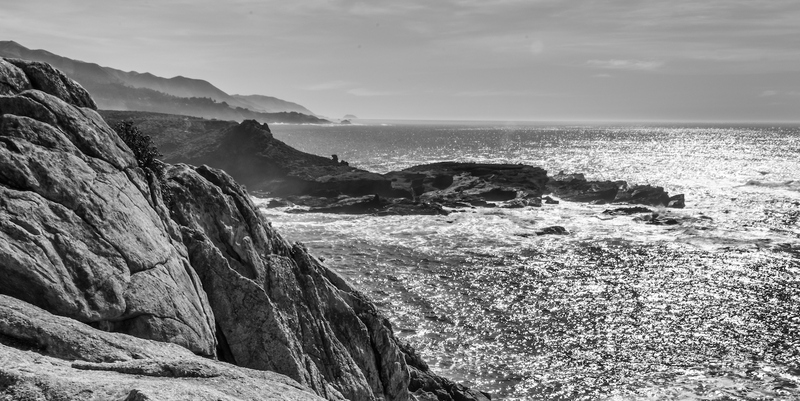 To see more Point Lobos photography, visit my archives – licensing and fine art prints are available, and my collection of black and white fine art print offerings continues to expand, with many more complimentary images that look exceptional as single prints and in sets. Did you know that I regularly share new content and short behind-the-scenes insights on Instagram? My blog content is now available on Bloglovin as well, and you can find my Instagram feed here and follow my blog with Bloglovin here.